Although I’ve abandoned fast motorboating since the European Commission decided to curtail the use of excise duty free diesel for boating, even international boating, largely, I’m still very much interested in new developments. 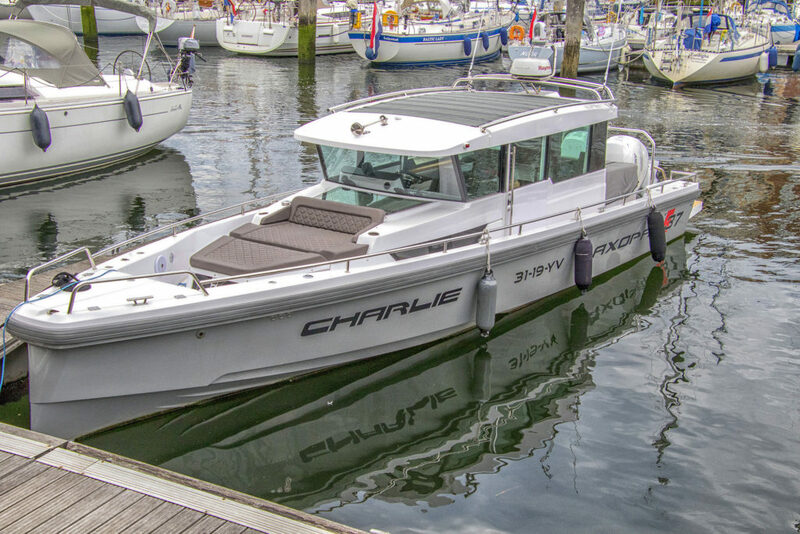 When i saw this Axopar 37 AC for Aft Cabin berthed in Scheveningen Marina, I thought “Hey that boat must have some potential with those two large outboard”. I hadn’t seen the boat before nor read about it before. After some research I found a test by Motorboat and Yachting and a Dutch Language extensive demo video by the Dutch dealer Kempers from Aalsmeer. It’s bow section seems to apply the same principles as the Axe Bowe designed by Damen shipyards for rescue boats and fast patrol-boats and offshore crew tenders.